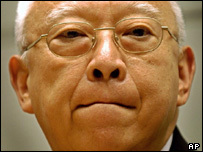 Hong Kong's chief executive Tung Chee-hwa has decided to resign for health reasons, according to local press reports. Mr Tung, 67, took over as leader of the former British colony when it reverted to Chinese rule in 1997. Last year, Hong Kong saw massive pro-democracy protests, as Mr Tung became increasingly unpopular. His term of office is due to end in 2007. The government in Hong Kong has so far refused to comment on the reports. The chairman of the opposition Democratic Party, Lee Wing-tat, said it was strange the reports had not been denied. "If there's a widespread rumour about this thing, it's very natural for the central authority or even Mr Tung himself to stand out and make everything clear but we don't have that sign at this moment," he said. Mr Tung also refused to respond to reporters' questions before leaving on Wednesday for a scheduled trip to Beijing, where he will take part in a meeting of the nation's top advisory body, the Chinese People's Political Consultative Conference (CPPCC). The BBC's Hong Kong correspondent, Chris Hogg, says that if Mr Tung does resign, it may be announced at the end of the CPPCC meeting in 10 days' time when it is understood he will be made a vice-chairman, a position of some influence. Such a move would allow Mr Tung to save face, our correspondent says. His deputy, Donald Tsang, is expected to take over from him, local press reports said. Chinese and English-language newspapers in Hong Kong added that stress and ill health would be cited as the reason for Mr Tung's resignation. The papers said the resignation had already been accepted by China's Communist Party politburo. Mr Tung, a former shipping tycoon, was elected by an 800-member committee loyal to Beijing and was thought to be a safe pair of hands. But soon he was being characterised as aloof and out of touch, says our correspondent. He was accused of mishandling major events, from the Asian financial crisis in 1997, to the Sars outbreak in 2003 which killed several hundred people and left the economy on its knees. The Hong Kong Economic Journal reported that Beijing's faith in Mr Tung's capacity to create greater stability in Hong Kong had faded. Many on the streets of Hong Kong said they would welcome a new leader. "I will be happy if he goes," secretary Rosanna Chung told Reuters news agency. "He's not good. He has been slow in implementing policies." But others expressed concern that Mr Tung's resignation could allow Beijing to tighten its control over the territory. "Maybe Beijing has (already) decided who should succeed Tung," said pro-democracy legislator Emily Lau. "If that's the case, it's very unfortunate because everything is being controlled and managed and Hong Kong people have no say," she said.